Pin Sale – Schemm Bowling Inc. In Stock Now at our Deerfield, WI warehouse. Brunswick Max pins deliver to the max — maximum durability, maximum scoreability and maximum reliability. Pins are constructed from the finest North American Hard Rock Maple and kiln dried on site for superior moisture control and consistent performance. Our state-of-the-art compression molding process fuses two Surlyn® halves around the wood core creating greater strength and enhanced durability. The wood’s edgegrain is also aligned to face the outside of the pin for long life. Add to this the exact placement of control holes to secure the structural integrity of the middle panel and neck strength. In fact, the laminated core is stronger than the wood itself, assuring high scoring pin action. The molded-in base keeps the pin surefooted – minimizing out of range calls. Finally, a three-layer topcoat system is utilized to protect from dirt, oil and scratches, and our special screening process ensures crisp logos in traditional red or graphic glow crowns and stripes. 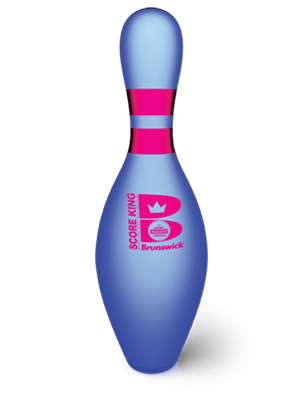 For glow-in-the-dark bowling, Brunswick Graphic-Glow Max Pins feature UV brightener for ultra-white glow under standard lighting and even brighter under UV conditions. Graphic-Glow Max pins also scan easier for more accurate electronic score keeping. The high-scoring action they want, and the features you need for maximum durability. Our commitment to quality shows with each set of pins — wrapped in plastic and shipped in extra-tough cartons. Pins are constructed from the finest North American Hard Rock Maple and kiln dried on site for superior moisture control and consistent performance. Our state-of-the-art compression molding process fuses two Surlyn® halves around the wood core creating greater strength and enhanced durability. Add to this the exact placement of control holes to secure the structural integrity of the middle panel and neck strength. In fact, the laminated core is stronger than the wood itself, ensuring high-scoring pin action. A three-layer topcoat system is utilized to protect from dirt, oil and scratches, and our special screening process ensures crisp logos in traditional red or graphic glow crowns and stripes. The molded-in base keeps the pin surefooted — minimizing out of range calls — and every pin is backed by a full one-year warranty. © Copyright - Schemm Bowling Inc.